In other words, PTI held a dharna in May to organize a jalsa in October to mobilize the nation for a sit-in at some time in the future. Truly, an extraordinary strategy for solving the many issues facing the nation. Sunday’s rally will also find political watchers looking for the answer to the question of whether or not SMQ will finally announce if he is switching parties. 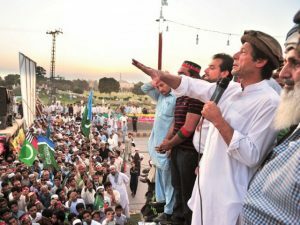 He was noticeably absent from Friday’s PML-N rally, leaving many to wonder if it’s a sign that he has chosen PTI as his new home. Such a decision, of course, would raise questions such as how Zardari’s Foreign Minister fits into the PTI talking point of being ‘untested’ leadership. But I suppose Pir Imran Khan’s blessing washes away all sins. As Jalsa Wars continue, though, I can hardly wait to see what a great effect these rallies will have. Will dengue finally be eradicated out as machar are bored to death by endless speeches? Will Imran’s electric personality finally solve load shedding? Will sectarianism finally be wiped out as the whole nation unites as Shi’atu Imran? 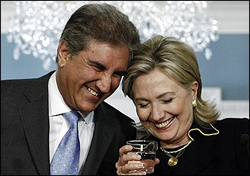 This entry was posted in Blogs and tagged dharna, imran khan, jalsa, pml-n, PTI, Shah Mehmood Qureshi by Mahmood Adeel. Bookmark the permalink. You, my dear sir, suffer from mental constipation! Why do we always hold PTI and IK in a different light? Do you apply your ‘holier-than-thou’ logic to PPP or PML-N? Let us not lose sight of relativity. A brainless chicken can tell you who is best amongst these 3. Mental constipation is a natural result when there is so much BS being shoveled into our heads. Why do we always hold PTI and IK in a different light? Perhaps because IK makes holier-than-thou statements about his vanity party being the only ‘pure’ and ‘untested’ option while all the rest are clouded in darkness. We are only seeing him in the same light that he sees himself. As for whether I apply my ‘‘holier-than-thou’ logic to PPP or PML-N, I think their supporters will tell you that I am an ‘equal opportunity offender’ . Actually, it is you who sees PTI and IK in a different light. Let us not lose sight of relativity. PTI may be the choice of brainless chickens, but I don’t see how that is a good reason for thinking humans to blindly support them. PTI has every right to be Holier than Thou because they are unlike PMLN they sticked to the APDM boycott. @Azeem, How is the weather in London?